From 01.01.2019 our prices have had to increase in order that the cattery remains a viable business. Prices have remained the same for many years and we had intended a modest increase with effect from 01.01.2019. However DEFRA have introduced new regulations with effect from 01.10.2018 which have blown our modest increase 'out of the water'. 3. Additional administrative demands that are going to be challenging to say the least. The daily rate applies for each full or part day your cat(s) stay with us. Please make sure you bring your cat's vaccination certificate when booking in. We are unable to accept any cats without a valid certificate. We will ask for your written authority to call a veterinary surgeon on your behalf should we consider it to be necessary. Vinnie - one of our regular guests, checking the temperature of his apartment! 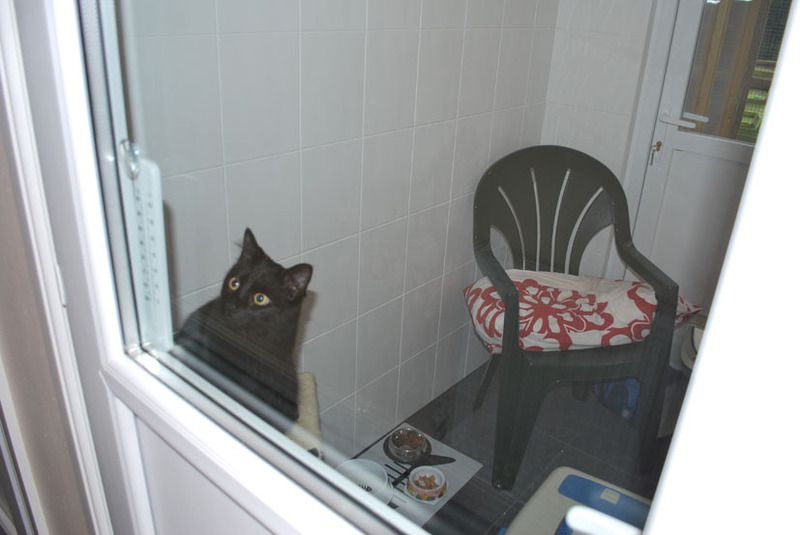 "Steve provides a fantastic service and, as well as being scrupulously clean, the facilities are all that anyone who adores their cat could wish for with their own radiator, chair, scratching post and outdoor run. The photos speak for themselves. I would strongly advise booking as early as you can or your cat won't be able to stay in this wonderful place because, once your cat has stayed here, you'll just keep coming back".